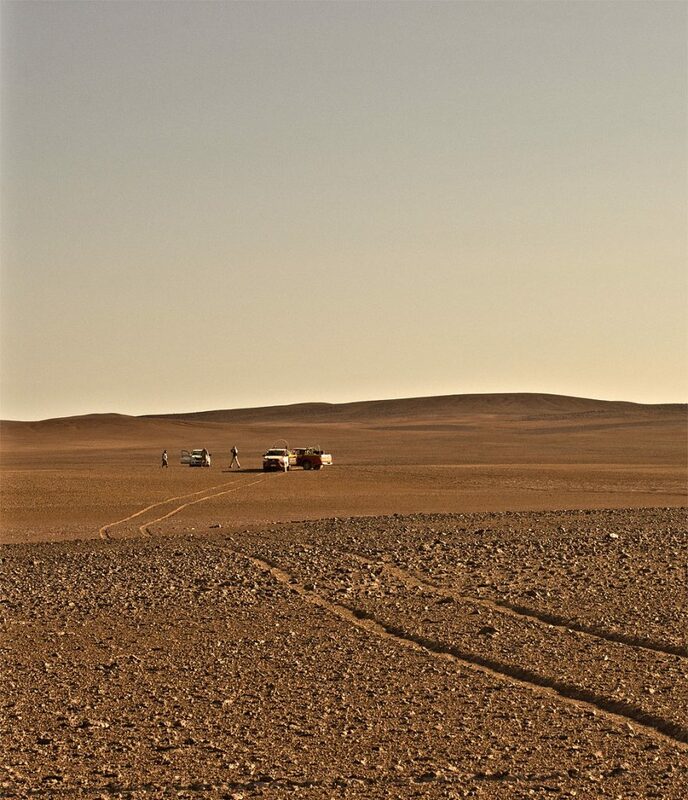 Meteorite Recon | Excerpt from the illustrated report of the Northern Chile, February 2017 Atacama meteorite expedition. Excerpt from the illustrated report of the Northern Chile, February 2017 Atacama meteorite expedition. 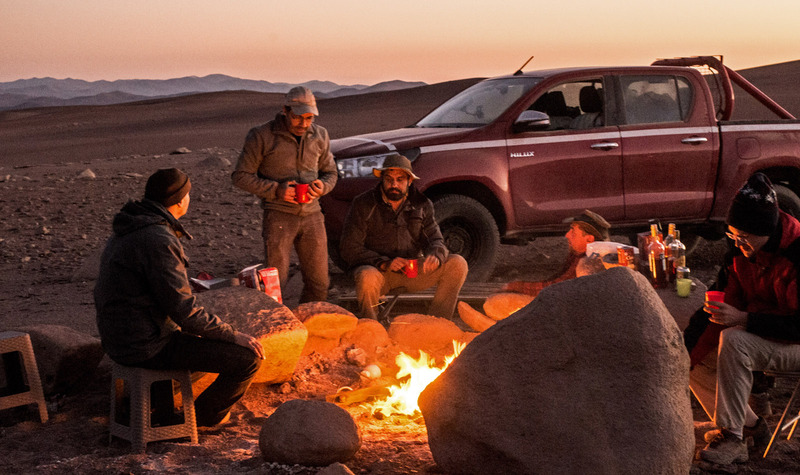 Excerpt from the illustrated report of the Northern Chile, February 2017 expedition. Our path took us to the opposite side of the valley. Finally, around noon, the terrain opened up and became drivable again. Meanwhile the others had fought their way across the boulder field and could be seen in the far distance. “We need to catch up or they’ll get lost” I said to Peter. We were both looking through our binoculars for a navigable passage across the obstacle and to the other side of the valley where the rest of the team was searching. We set out on what we took for a good course but soon found that the Terrain ahead was intersected by a maze of open pits, trenches and rock piles. Those were the remains of saltpeter mining operations and of the same age as the dismantled railway that we’d encountered earlier, both dating back to the late 19th century. 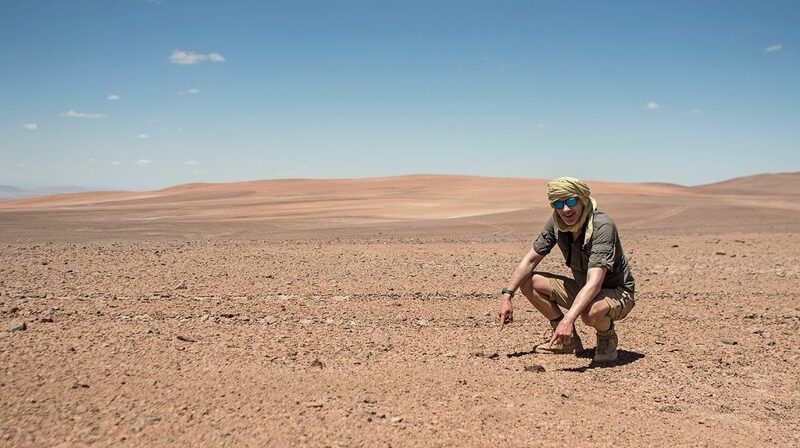 “I don’t know Thomas, but given the lack of desert varnish on the local rocks, I have the suspicion that meteorites aren’t necessarily black over here.” I replied. “Not? Then what color are they?” Thomas inquired. “Perhaps more of a dull brown … more like this one over there,” I said, pointing to an unobtrusive stone, just a couple of meters before of us. We continued to talk while I bent down to casually brush the magnet against the rock, and, lo and behold, it flipped at it and stuck. I looked at Thomas, who was equally stunned. I considered myself no beginner in the field of meteorite identification, yet I had never even heard of a taste test for meteorites. And although I had worked with Sergey for many years, to this day I had been unaware that he had somehow developed the ability to ID a meteorite by licking at it. Color me impressed! One day Serge needs to teach me that trick, I thought. When I looked at the stone again, however, the scales fell from my eyes. Sergey had just removed the dust coating and thus made visible the chondrules in the matrix. This was how we found and confirmed the second stone meteorite of the tour. On occasion of our noon break, we conducted a closer inspection of one of the ancient sodium-nitrate digs. The workers had removed the soil to a depth of 1 meter, at which the caliche ore, the nitrate-rich layers, occurred. The overburden was piled next to the pit or filled in digs that were already exhausted. Apparently the nitrate had been filled in sacks and manually or by mules had been carried over to the nearby loading platform. Next to the remnants of the railway, the foundations of a small stone building could be seen, and around it were the remains of numerous dwellings and fire pits. Forged nails, cans and enameled pots dated the site to the late 19th, early 20th century. After that the operation must have ceased, as we did not find any artefacts produced later than around 1920. This was in concordance with the history of nitrate mining in Chile. For more than a century, the Atacama had almost exclusively provided the world supply of mined saltpeter. Starting in 1879, Chile had even fought and won a four-year long bloody war, the Guerra del Pacífico, with its neighbors Peru and Bolivia for the Saltpeter sources. At the turn of the 20th century, however, the German chemists Fritz Haber and Carl Bosch developed an industrial process to synthetically produce ammonia from the atmosphere. With the onset of the 1st World War, Germany began converting ammonia into a synthetic Chilean saltpeter at large scale for the production of gunpowder and fertilizers. 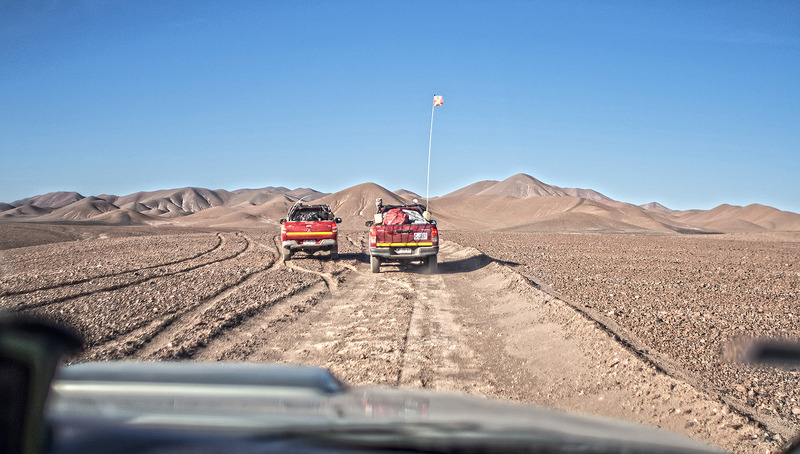 Until the 1940s, this conversion process resulted in a dramatic decline in demand for sodium nitrate procured from natural sources and the majority of mining operations in the Atacama came to an end. The search in the morning and the ardous drive to the new area had exhausted us. Early for our standards we called it a day. Below the summit of a hill that offered a splendid vista we pitched camp. Large solitary boulders were strewn about the site that looked as if giants had abandoned a game of marbles. Marc had already set up the kitchen, and while Andi and I piled up the sawed telephone poles into a neat fire stack, Marc went for a stroll and disappeared behind the hill. Five minutes later, Thomas, who peacefully sat at the dinner table and thought about what stellar clusters he would observe tonight, had a close encounter of the third kind. All of a sudden, a pick-up appeared from out of nowhere and came dashing towards our camp. A quick glance confirmed Thomas that none of our own trucks were missing. It had to be somebody else. The truck was now closing fast, and the sight of it caused Thomas to almost spill his cup of Early Grey. On the truck bed he could make out two cloaked figures, one of them sporting a fierce beard, and they were yelling and shouting. “Jihadists!” Thomas was convinced. Who else would dare to interrupt his evening contemplations so rudely? However, before things escalated further, the truck came to a halt in a dust cloud and he recognized our own Marc as one of the “jihadists”. A little confused, Thomas turned to Andi and me: “Where in the world did he come up with these people. Who are they”? I was equally baffled. Everyone was now talking simultaneously, including the two Spanish speaking strangers that had arrived with Marc. They gave the impression that they were at least as confused as I was, which was comforting. From the bits of excited conversation, it appeared that the following had happened: Marc was casually walking over the crest of our hill, snapping pictures along the way, when to his utter surprise, just a stone’s throw away, he saw a car and two persons sitting at a small camp fire. Later the two told me their version of the incident. Unsuspectingly sitting at their camp fire they had just started to cook dinner. All of a sudden one of them, Javier, had jumped up and pointed to the next slope: “Un hombre!” “Impossibile”, the other, Jose, answered without looking up. “No, no amigo. Esa es la verdad, un hombre!” Javier insisted. And indeed, there was un hombre walking down the hill. When Marc had approached the two stangers, he politely wished them a good evening and then introduced himself: “Hello. My name is Marc. I am searching for meteorites here.” The two Spaniards looked at each other in disbelief. “Wer’re also searching for meteorites here!” “Well, I’m here with Svend Buhl and Sergey Vasiliev …” Marc continued. “What? Sergey is here?” exclaimed Jose, as the two had made some meteorite deal just recently. “Let’s go!” In a hurry, they jumped in their truck, Javier pulled up Marc, and off they went over the hill to our camp, where their arrival had the described effect on Thomas. Now that they were there, we invited them for a little party and perhaps a drink. It turned out that this day was Jose’s birthday, a fact that contributed severely to the further depletion of our stock of alcohol. Meteorite fragments next to a pair of old tracks. We learned that Jose and Javier already had plenty of experience in the Atacama. Eagerly we listened to their stories of past adventures and legendary finds. In return, we shared our own experience from African and Arabian deserts. 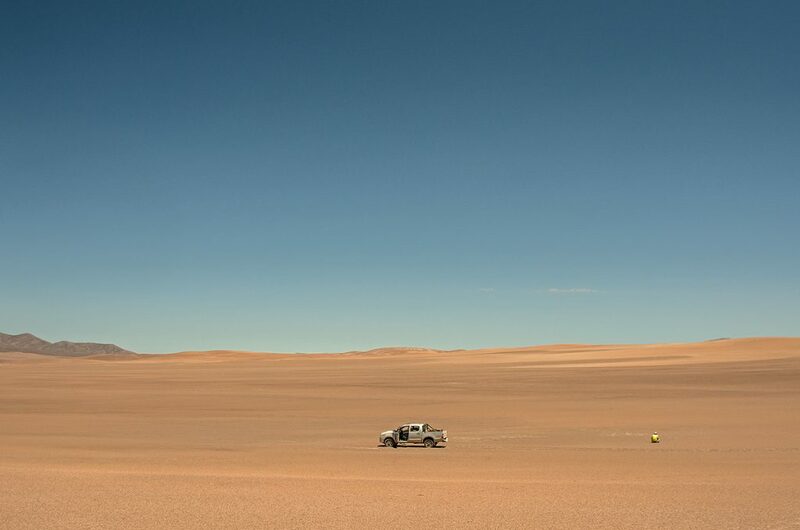 Jose and Javier had searched the surroundings for just three days, but had already found ten meteorites. All were more impressive than our own two finds. 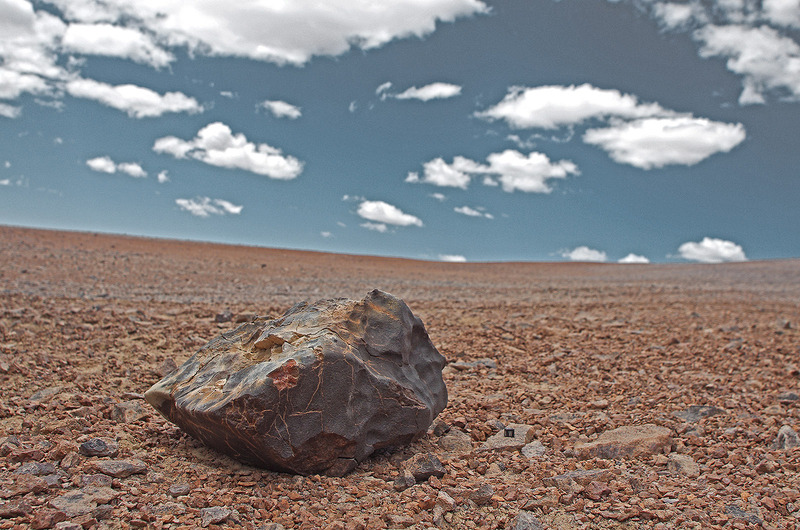 A fact that we credited to their superior knowledge of the Atacama meteorite fields and their peculiarities. In the morning, we parted, but not before Javier had found a small weathered chondrite fragment on his daily morning walk. This had happened just hundred meters from our tents. We were truly impressed by the two and wondered whether we would match their success. Our concerns were unsubstantiated, as just twenty minutes into the search, Thomas scored a hit. A particularly nice one at that. Sergey was driving their truck up a slope, when short of the peak, Thomas yelled “stop”, jumped out of the car and signaled a find just next to them. The meteorite was a compact mass of about 1 kg, half embedded in the soil, and most of the exterior still covered with rust-brown fusion crust. Marc and Andi were doing even better. In the first two hours, they had found no less than three meteorites, all chondrites. Peter and I were unaware of their successes. Our friends were searching parallel to us behind a ridgeline and we had long lost sight of them. The next meeting at a pre-aligned waypoint was not scheduled before 2.00 p.m. For us the day had started with a false alarm. I had spotted and began to document a weathered mass of basalt before I recognized it as such. On our course we repeatedly encountered boulder fields, and since Javier’s find had given us proof that the surface was old and promising, we diligently searched those as well, but to no avail. Well, it was excellent news that the team had scored so well, just why Peter and I had failed to come up with any result ourselves remained a mystery to me. “Look Svend, come over” Sergey called over again. “Bring it,” I replied, as I had already taken out a folding chair and lazily sat down in the shade of the car. “No, it’s too big,” it came back. That got me up. When Sergey opened the door to the back seat, I couldn’t believe my eyes. They really had found a big one. Sergey lifted the stone and proudly placed it on the ground for us to admire. The specimen had a complex shape with a more or less triangular outline, with flat top and underside but heavily sculpted flanks, much like the skull of a reptile. Adorned with large regmaglypts and contraction cracks that stood out in a striking pattern of caliche lines, the meteorite was both size-wise and aesthetically impressive. We baptized it “El Capitan”.